Nary a month goes by where we don't see a story about someone trekking across the country — by foot or on wheels — for one cause or another. It's actually become so common that it's no longer newsworthy. 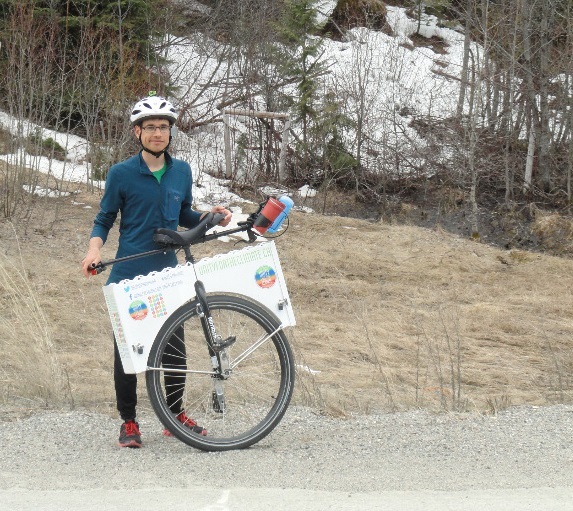 But Joseph Boutilier's journey is kind of unique: he's travelling from Victoria to Ottawa on a unicycle to call for political action on climate change. Boutilier — a 24 year-old game designer from B.C. — left the west coast, sans an entourage, in April and is hoping to reach Ottawa by September 15th. He cycles six to seven hours a day — mostly along major highways — with his clothes, toiletries and tent packaged in his backpack and two aluminum cases bolted on to the sides of the unicycle. He spends his nights wherever he can: he's slept at sponsored motels and hotels, with billets, at campsites and even in random bushes. He says that the motivation for his journey was the Harper government's inaction with regard to climate change. "Canada used to be a leader on environmental issues in general and we've really dropped the ball and I feel like we are now obstructing international progress specifically to address climate change," he told Yahoo Canada News, referencing our repudiation of the Kyoto Accord. "We have the knowledge. We have the moral obligation to do much more to try and mitigate the crisis while we still have a chance." In Ottawa — on September 15th — Boutilier hopes to meet with MPs, cabinet ministers and party leaders to spread his message. "Ultimately, unlike many folks of my generation, I suppose I still have a lot of hope for our parliamentary democracy," he said. "Uni-cycling is really just a way for me personally to demonstrate my commitment in trying to inspire others to also demonstrate really a political willpower for the government to take more direct action." Incidentally, a couple of weeks ago, Rick Smith of the left-leaning Broadbent Institute wrote an op-ed for the Toronto Star suggesting that the Harper government's policies have rejuvenated the environmental movement. While the Conservative government claims that they are tackling climate change — with their sector by sector regulatory approach on greenhouse gas emissions — environmentalists have criticized them for their position on the Kyoto accord, their promotion of Alberta's oilsands, for allegedly muzzling scientists, for spending cuts to research and for weakening the Navigable Waters Act. Indeed, in recent years we've seen a ramping-up of political action from environmental activists be it in the form of Idle No More protests, anti-pipeline demonstrations, sit-ins, climate concerts and even organized website blackouts. While Boutilier isn't getting the attention the likes of cross-country trekkers Terry Fox or Steve Fonyo did in the 1980s, his uni-cycling campaign appears to be the latest product of the environmental movement's new awakening. (Advisory: Story includes language that might offend some readers.) By Sarah N. Lynch and Andy Sullivan WASHINGTON (Reuters) - Special Counsel Robert Mueller's report on his inquiry into Russia's role in the 2016 U.S. election detailed a series of actions by President Donald Trump to impede the probe, raising questions about whether he committed the crime of obstruction of justice. The release on Thursday of the 448-page report that disclosed the findings of a 22-month investigation represented a watershed moment in Trump's tumultuous presidency. The winner of a Saskatchewan tourism award wants to see people visit the Grasslands National Park — and come back for another round. "My goal is that when people come that they're welcome and they're going to have a good time … and they'll come back again," said Brenda Peterson. The interpretive co-ordinator officer at Grasslands National Park has been named the recipient of the Tourism Saskatchewan Employee of the Year Award.